Talk to the small Goron, ask him about the fire dragon and then ask him about the Gorons. Use the Hookshot and target the bottom of the branch on the tree. When the last Shadow Link is defeated, enter the door and open the big treasure chest for the Longshot. Climb the small, uneven rock wall to the left of the guard, cross the ledge, and drop onto the path that surrounds the castle. 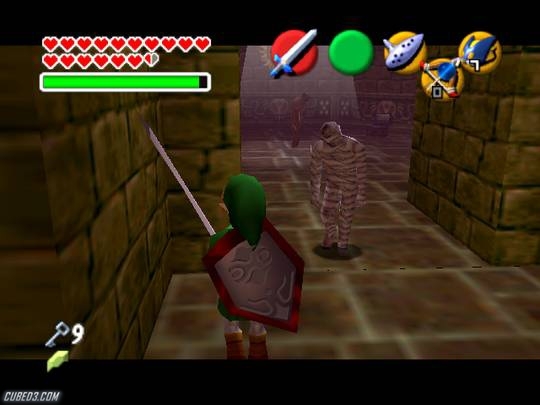 Link will then automatically return to the main room. 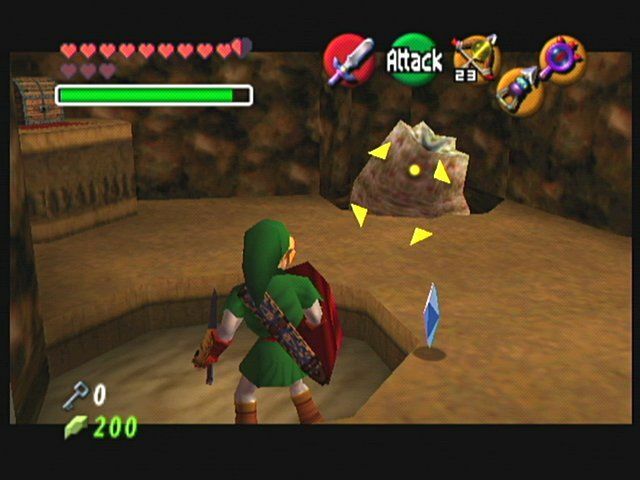 Get the Spin Attack After receiving the Goron's Ruby as a child, go up the path away from the Cavern entrance to the first corner. Climb to the next ledge, hit the rusted floor switch with the Hammer and enter the door. Turn right, get onto the next ledge, go forward to the wall and turn right. There are bushes along the edge of the room to refill Link's life or to get more Deku Seeds for the Slingshot. Use a Bottle to capture some Blue Fire from the middle of the room and melt the red ice. Forest Temple - Find the Boss After activating the elevator in the main room, ride it to the bottom. If you run out of life or magic, drop down the pillar, and break the jars for them. Stand next to the pedestal and drop the Master Sword in the pedestal to become a child again. Go forward to the wall, turn left and drop off the roof to land on the wooden platform above the fenced-in area. As you enter the forest, immediately turn left, and climb onto the nearby ledge. Enter the door on the right, walk to the opposite door from where you entered, and enter it. Speak to Princess Ruto, and she will fall through a hole in the floor. Agree to help, and enter the small opening. Win Talon's Chicken game in Lon Lon Ranch! Small Key Three - From the Temple entrance, go forward and enter the next two doors. Use the Bow to shoot the picture when the ghost is visible. With the door to the left of Link, walk forward to make a flame appear. Enter the opening you created and go forward to reach a single pillar of fire. Shoot the switch above the door with the Bow to straighten it out, then enter the door. Jump across the gap and hit the rusted floor switch with the Hammer to free the Goron down below. Go to the far-right corner, walk up two sets of ladders and go to an archway. Now since I have already beaten this part I go straight through a tunnelish looking thing. When flames shoot out of a hole, Volvagia will pop up from that same opening. 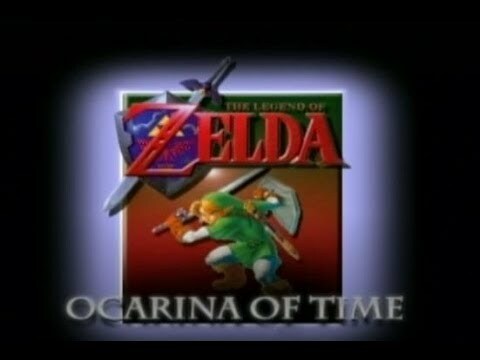 Stand on the gray square grating and play Zelda's Lullaby to create an opening in the waterfall. When the witches fuse together, hold the Mirror Shield and let the attack hit the shield to absorb the same attack three times in a row, then quickly Z-Target. Use the Bow to hit the Poe Sister ghost, Joelle, when she's trapped in a picture. Use the Shield to protect Link from the flying tiles and enter the next door. 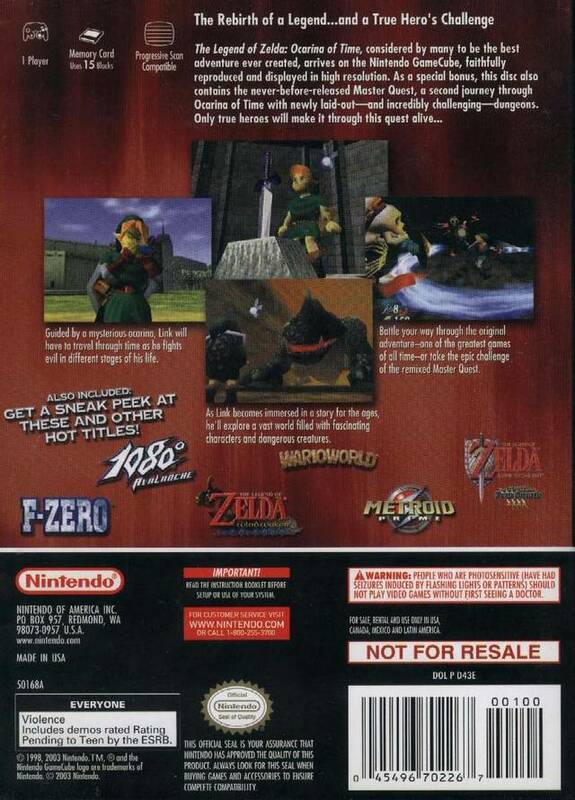 Gerudo Fortress; Adult Link; Longshot - At the Roof of the Fortress, use the Longshot on the Treasure Chest to get to it and open it. Continue to Kakariko Village and go up Death Mountain to Goron City. Climb back up onto the ledge, go through the door and walk forward onto the next pillar. Follow the left wall to the first wall of red ice and use the Blue Fire to open it. Go forward onto the next ledge and turn right. Defeat the Poe Sister Amy to activate the green torch. Turn left, and walk to the sleeping man, Talon. Equip the Hover Boots, go to the platform, turn right and go to the edge of the platform. Put Ruto down and use the Slingshot to hit the white switch on the ceiling to open the next door, then pick up Ruto and enter the door. The web will break and Link will land on B1. Using the Lens of Truth to see the walls, walk away from the door and take the first left. Deku Tree - Break the Web After you get the Fairy's Slingshot, use it to shoot the ladder down and exit the room. Fall through the second hole in the floor, then follow the hallway and enter the door. Get out of the water and go to the alcove to the left of the only door to reach the well. This weapon is twice as powerful as the Master Sword, and will not break like the Giant's Knife. Then find a circle of stones then stand in the middle and play the song of the storms and there should be a hole that appears! Follow the right-hand wall to the second door and enter it by collecting five Silver Rupees. Continue forward, around the crossed wooden beams, and through the middle of the far wall again. 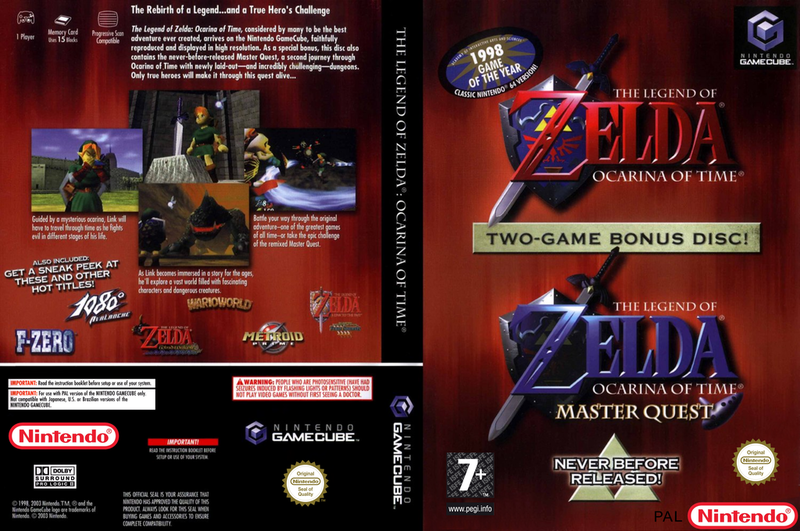 Use the Longshot to reach the next level and play Zelda's Lullaby at the Triforce symbol to raise the water to the middle level. Enter the blue light to exit Jabu-Jabu's Belly and receive the third Spiritual Stone, Zora's Sapphire. Walk away from the gate to find Malon next to the vines. Take this to Skull Kid's clearing in the Lost Woods and give it to Grog. Get on the ledge and enter the large opening to appear in the Ice Cavern. Follow the room around to a shallow pit.